By withdrawing banking services from more than 250 money-transfer companies, Britain’s Barclays Bank risks severing an essential lifeline for millions of people in Somalia who depend on remittances from relatives in the UK, warn humanitarians, rights activists and academics. For most of the remittance firms, the move is set to come into effect on 10 July, although an extension of 30 days has been granted to some of the companies. Barclays said there was a risk that some of the firms might be “unwittingly facilitating money laundering and terrorist financing”. Companies set to have their Barclays accounts shut down - effectively ending their UK operations - include one of Africa’s largest remittance firms, Dahabshiil. While countries other than Somalia may also be affected, ongoing humanitarian challenges in the nation and the absence of a formal banking system there mean that Barclays’ decision could have devastating consequences. “We are seriously worried that without the services of these money transfer organizations, Somalis living in the diaspora throughout the UK… will not be able to send desperately needed support home to their relatives. This will have immediate and severe humanitarian implications,” the appeal added. Four leading international aid and development NGOs have this week written privately to Barclays asking the bank to reconsider its decision, warning of significant humanitarian fall-out. According to Senait Gebregziabher, Somalia country director at Oxfam and one of the signatories of the letter to Barclays, stopping the transfers would see many more Somali families “fall back into crisis”. Somalia is still recovering from a famine that killed some 260,000 people in 2011. A report soon to be published by the NGOs Oxfam and Adeso estimates that members of the Somali diaspora in the UK send over 100 million pounds ($152.5 million) to Somalia every year. These remittances are reportedly second in total value only to those sent back from the US. The NGOs’ research suggests that remittances account for around 60 percent of the recipients’ annual income, with money mostly being used to cover basic household expenses. Mogadishu resident Halima Mohamed and her family depend entirely on financial support sent through money-transfer firms by her two sons in Britain and Denmark. “My sons send $300 dollars each month, which we use to cover our basic needs like food, water and rent. Three of my children are at school, while one attends university, and we’ll find it hard to cope with the situation if Barclays proceeds with its decision,” she told IRIN. Remittance firms serving Somalia have developed systems that help them operate in a country with no formal banking infrastructure. Using bank transfers where possible, the firms also use non-bank financial transfers based on trust and social solidarity, commonly known as ‘hawala’, meaning “transfer”. This system has become vital both for the delivery of support to families for business development. Aid groups rely on these systems as well. “While this suspension will not affect our local transfers, it is worth noting that the UN and many of the large relief and development organizations use hawala money transfers to pay their staff, procure assistance, and implement very successful emergency aid and poverty-relief programs such as cash-for-work,” the UN’s Dawn Blalock Goodwin told IRIN. For Barclays, the question is one of compliance with international financial regulation and potential risk to the firm - both in terms of reputation and possible legal penalties from the US and other jurisdictions. "As a global bank, we must comply with the rules and regulations in all the jurisdictions in which we operate. The risk of financial crime is an important regulatory concern, and we take our responsibilities in relation to this very seriously,” said Daniel Hunter, spokesperson for Barclays. “Abuse of their services can have significant negative consequences for society and for us as their bank. We remain happy to serve companies who have strong anti-financial crime controls, but are asking the others to find another bank. This is solely about the company’s controls, not where they send money to,” he added. The Barclays decision follows HSBC’s payment last December of a record $1.9 billion fine to settle accusations from US prosecutors that it had failed to implement anti-money laundering controls and allowed terrorists to move money around the financial system. The UK’s financial regulator also warned British banks on 1 July that they were not doing enough to protect against financial crime, saying they could face punishment for failing to spot abuses such as sanctions violations or terrorist funding. In 2011, two Somali women in Minnesota were convicted of funnelling money to Al-Shabab militants using hawala brokers, and a Somali website, Sunatimes, has made allegations linking Dahabshiil to the Somali Islamists. Dahabshiil strenuously denies the claims and is taking the Somali journalist who runs the website to court. But some argue the move by Barclays will shift legitimate transfers to murkier channels. More than 100 academics and aid practitioners wrote to the British government last week to protest Barclays decision, warning that closing down money transfer channels “will only encourage people to send funds through illegal, unsafe, and untraceable channels, thereby potentially making the problem of support to proscribed parties much more serious”. While the threat to remittance flows into Somalia has provoked the greatest outcry, there is also concern about the impact on Somali refugees in neighbouring Kenya. According to hawala companies operating in the 20-year-old Dadaab camp, which houses two-thirds of Kenya’s 500,000-strong Somali refugee population, more than a third of camp residents depend on remittances sent from abroad. 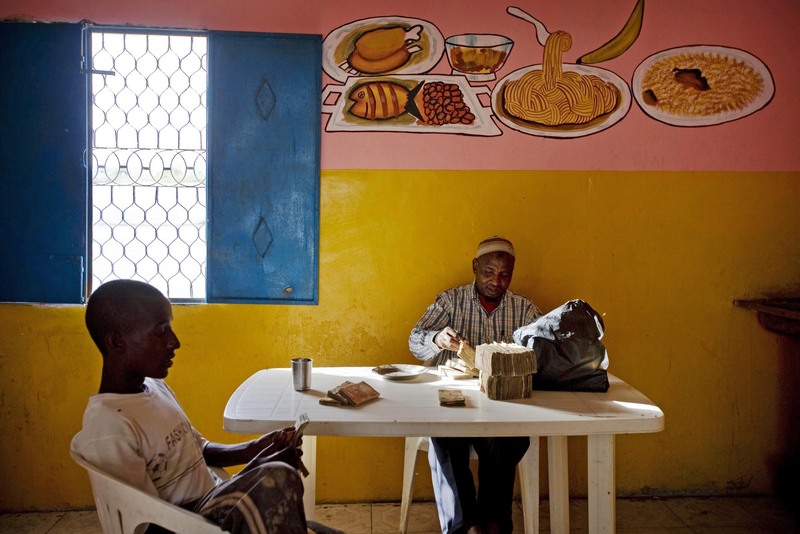 Refugees are not allowed to move out of the Dadaab complex, but many manage to run thriving businesses in the camp by using remittance money to contract people to buy goods for them in Garissa, Nairobi and Mombasa. “We are regulated by the UK government. We are a licensed institution as is any other legal company,” Abdirashid Duale, CEO of Dahabshiil, told IRIN. Somali President Hassan Sheikh Mohamud has also called on Barclays to reverse its decision, stressing that the country is at a turning point “after two decades of chaos”. “We understand Barclays’ corporate responsibility and its duty to its global customers to maintain a reputation for tackling financial crime, but that does not have to mean pulling the rug from under the feet of people battling extreme poverty - and before our fledgling government can step in to help,” he said in a statement last week. Though faltering in its recovery - with some 10 percent of its population still reliant on humanitarian aid and violence ongoing in parts of the country - Somalia is seen as taking some steps in the right direction, a transition in which the UK is playing a key role. In May, UK Prime Minister David Cameron, with President Hassan, hosted the second London Conference on Somalia, at which international donors pledged some $300 million in assistance. But remittance flows to Somalia remain the country’s highest foreign exchange earner, and are a vital revenue stream. Any drop in remittances would throttle signs of economic recovery, analysts say. “Somalia is almost entirely dependent on remittances, and if the closures come into effect, this could cause a humanitarian crisis as well as economic stagnation,” Somali economist Professor Yahye Amir told IRIN. Extending the central bank’s reach and introducing banking regulation are among the government’s many priorities. Normal bank transfers, such as SWIFT, are not currently possible. “Because Somalia’s crisis has been so prolonged, families have little ability to absorb shocks such as floods, droughts, disease outbreaks, displacement, a poor harvest or, in this case, an economic shock,” said the UN’s Lazzarini. “The key thing to realize is that when humanitarian needs are assessed, remittances are already factored in. So a withdrawal or disruption of remittances will likely increase the number of vulnerable households or, for already vulnerable families, increase their need for humanitarian aid,” he said. The UK’s Foreign and Commonwealth Office (FCO) noted in a statement the “important role” played by remittances “in supporting the economy and people of Somalia”. But an FCO spokesperson also said that “Barclays’ decision is ultimately a private commercial matter”.